Welcome to The Caucus Cafe and what I hope will be a regular weekly series featuring recipes, food discussions and a place to ask for help with your own “kitchen conundrum.” Everyone has to eat. More importantly food is a great way to bring people together and that’s always a wonderful thing. Last week we opened our larder and found seasonal clementines. Tonight we’re sharing a genuinely easy-to-make country-style boule. I became fascinated with yeast as a child. As far as I was concerned, the best treats were made of dough. My mother was an avid baker. She taught me to knead during the summer between fifth and sixth grade. My father was remodeling our kitchen, so he moved the stove and refrigerator to our basement. It was a hot summer, but the deep basement of our old farmhouse was nice and cool. I don’t think it had ever dawned on my mom what a nice place it could be to bake in before then. At the time, I was active in 4-H. Our county fair was the second week in August. I decided I was entering all the yeast categories, not that there were all that many, but you get the idea. I even entered fancy baked goods. Everyone else in fancy brought decorated cakes that were so large, you could serve a wedding reception. My tree shaped cinnamon rolls drizzled with a confectionary sugar and water mixture didn’t impress the judges. Most kids would have went home in tears. I had a few, but it didn’t take long to knead my bruised ego away. I’d be back. Over the next several years I continued to bake. I even won an award (a dinky pin and a certificate really) for outstanding achievement in yeast one year before I graduated high school. For years now I’ve been baking up a storm. You name it, I bake it. I even buy caraway seeds by the pound because we make so much rye bread. And then, damn if something else didn’t happen. I found a recipe I downloaded, but never tried. It was Mark Bittman’s original article on a no-knead, bread-in-a-pot technique and a recipe from the Sullivan Street Bakery in New York. “The article, written by Mark Bittman, had an immediate impact: a cascade of Internet traffic that resulted in home bakers all around the world giving it a shot---and reporting great success. “That’s just what I always wanted. I wanted to do whatever I could to help bread matter more, for people to fall in love with bread and I did when I began baking two decades ago. The object of my deepest affection, especially early on, was the rustic, deep-flavored bread of the Italian countryside." I don’t care if you’ve never made a loaf of bread before, you MUST try this. It’s utterly amazing. No wonder this no-knead method of baking has acquired an almost cult-like following. You can put a loaf of rustic bread on your table every day. It only takes a few minutes of time and a few pennies for the ingredients. Watch this video demonstration by Bittman and Lahey. Yes, you need a dutch oven. One that’s four to five quarts is perfect for this recipe. Buy one at a yard sale if you don’t already have one. Don’t even worry about why it works. Remove the dough from the bowl and fold once or twice. Let the dough rest 15 minutes in the bowl or on the work surface. Next, shape the dough into ball. Generously coat a cotton towel (not a terry cloth one) with flour, wheat bran, or cornmeal; place the dough seam side down on the towel and dust with flour. Cover the dough with a cotton towel and let rise 1-2 hours at room temperature, until more than doubled in size. Preheat oven to 450-500°F. Place the pot in the oven at least 30 minutes prior to baking to preheat. Once the dough has more than doubled in volume, remove the pot from the oven and place the dough in the pot seam side up. Cover with the lid and bake 30 minutes Then remove the lid and bake 15-30 minutes uncovered, until the loaf is nicely browned. Remove from pot and cool on a rack before slicing. In a nut shell, the long, slow rise has the same affect on the ingredients as kneading. 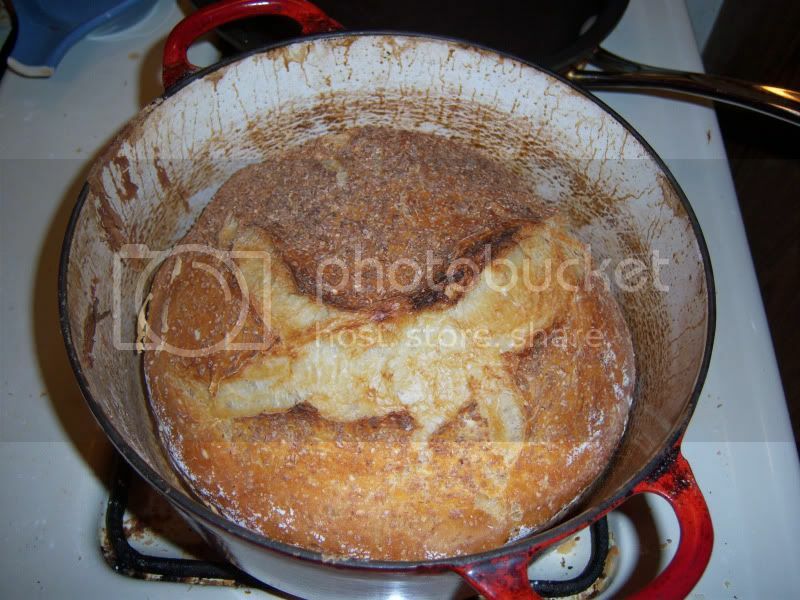 The blazing hot dutch oven simulates a bakers oven - it’s very hot and lid traps in the steam, which contribute to a good rise and a great crust. Over the last couple of years, I’ve made this bread and several variations. I’ve added wheat and rye flours, cheese, herbs, cocoa powder and dried cherries, unsweetened coconut and semi-sweet chocolate chips. Everyone of them has been better than the one before. Every one of them has been consumed with gusto in lightning time. This bread brings smiles to people’s faces. I’m hooked. A few pictures as proof positive, that anyone can make this bread in an ordinary home oven. It weighs about 20 ounces. Similar loaves sell for between $5 and $6 at local stores. The baking time without the lid is about 8-10 for the smaller loaf. A three quart dutch oven will fit into a 12” tabletop convection oven. I’ve baked several loaves successfully this way. You may need to remove the nob from the lid if you need a little more clearance - just plug the hole it leaves by threading some aluminum foil through and fanning it out over the opening. That’s it for now folks. We’ll see you again next Wednesday with another Caucus Cafe special. Same time. Same Channel. In the mean time, please feel free to share a recipe or a culinary custom with your fellow 99%ers. I don't mind kneading though, it's good exercise for my hands. But what I am really looking for is the best pizza dough recipé for a thin crust pizza. No need for a no-knead recipé. 2. In a small mixing bowl, stir together 200 grams (about 1 cup) lukewarm tap water, the yeast and the olive oil, then pour it into flour mixture. Knead with your hands until well combined, approximately 3 minutes, then let the mixture rest for 15 minutes. 4. To make pizza, place each dough ball on a heavily floured surface and use your fingers to stretch it, then your hands to shape it into rounds or squares. Top and bake. Let us know if you try it and what you think. Thank you, I'm trying it out today! and I just finished eating dinner. I need to get a Dutch oven and try this. You might get a real bargain there or at an estate sale. I was lucky enough to have a grandmother who gave me a dutch oven (the orange one in the pix) as a present to celebrate the first apartment I had on my own after I graduated from college. Fortunately, or unfortunately, I have a fair number of them now ranging from my mother's that came from Holland in the 40's (a shower gift from her godmother) to a cheap 3 qt. one I bought at a big box chain when I decided to reduce the recipe to eliminate a left over at the end of the day and I was curious about table top oven possibilities. The brand of oven I prefer for this bread is an Emil Henri. Yes, better than Le Cruset for this recipe. Not that anyone should worry because the difference if you're making an occasional loaf is minuscule. A Grand Opening? I'm there! 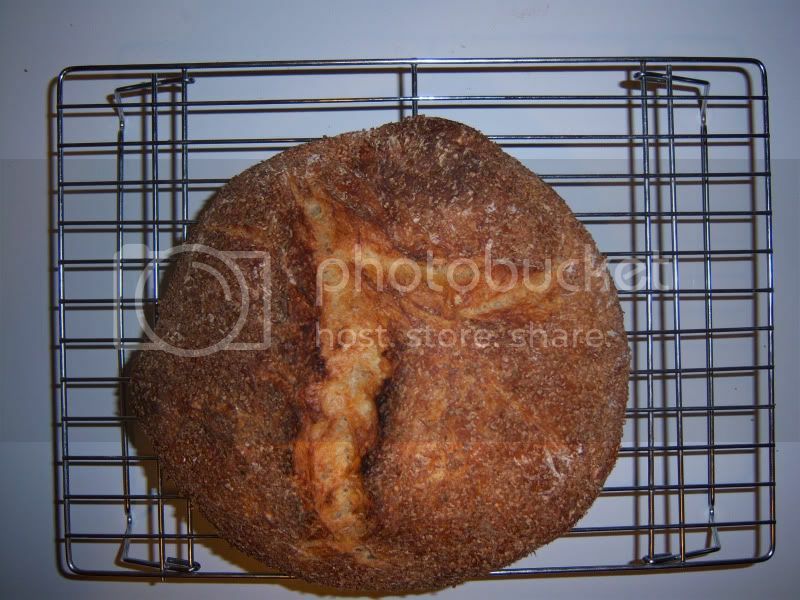 Funny, someone just mentioned this Sullivan Street Bakery bread recipe to me yesterday. Thanks for saving me the trouble of looking for it! But you want a recipe from me, now, don't you? Well, y'know what goes with bread: . . . soup. And in deference to the simplicity of this bread recipe, I'll post the simplest of soups, a French potato-leek number that also goes by the name of Vichyssoise. Melt half a stick of unsalted butter in a big (minimum 1.5 gallon) soup pot. Add six or more leeks (bearing in mind that there's no such thing as too many leeks), the white part, finely chopped and washed, and saute 'til clear, not browned. Add four big (or six medium) peeled and quartered russet potatoes and five or six cups of chicken or turkey stock (you do make and freeze stock every time you have a whole chicken or turkey, right? But you can also buy it, getting the low-sodium version, I want you guys around in my old age). Bring to a boil and then simmer until the potatoes are done, maybe a half-hour (maybe while your no-knead bread is cooking). Remove from heat and puree with an immersion blender. Add some white pepper (black will do, too, but it leaves little black specks in a soup that is decidedly white) to taste. There's the potato-leek soup. But you want the fancy stuff? Add cream (or milk or sour cream, or any combination, depending on your gustatory preferences and the thickness you want for your soup) until it looks and tastes right, up to maybe a cup of whichever you choose (sorry, I never measure). There, now it's Vichyssoise. Serve hot (in winter) or cold (in summer), but preferably with some fresh or frozen chives sprinkled over it. Marvelous with a hearty bread. Which you just made, right? I'd close with a French toast to match your Irish one, but French toast doesn't go with this soup as well as just plain bread does. We love soup. and frequently make long-simmering onion soup (ala Julia Child). The next time I see some nice leeks I shall make your recipe. And yes, I do make stock. I don't freeze it though. I can it. My parents lived in a place that was prone to losing electricity for a few years - the same farm house my dad redid the kitchen in the summer I learned to bake. Back then the best home chest freezers would only keep food for about 24 hours. It was too big a risk to freeze something the could be canned. Old habits die hard. holding myself back from inviting myself over to your house for soup LOL! that's normal and if it doesn't come on your first or second batch keep at it. Getting the heat and steam combo right is a matter of getting to know your stove and your dutch oven and how they work together as well as how long to let the dough rise for the temperature and humidity of your kitchen. If you can get the rise and crack, you'll have a lovely airy bread with a great crumb/texture. I love the cracked tops of artisan breads they make me feel like the bread is so crusty it can't contain itself. My current bread angst is that we have not only gone vegan, but have to some extent foresworn white flour. I miss the lightness. A lot. We're also no longer baking with butter, which is rather distressing. My boyfriend makes the most wonderful baking-powder biscuits. And now--they're not hockey pucks, by any means, but they are crumbly and dense because the lightening qualities of butter are missing. It makes me sad. And that goes for all the cobblers and dumplings as well. That looks like a great bread. What's the reason for foreswearing white flour? If it's due to how some manufacturers process it to death, there are alternatives in high end flours. Even if you're using all wheat or rye they can lighented up with flaked wheat germ. Try Bob's Red Mill products. Well, yes, it's because it's more refined. And refined flour and sugar aren't very good for anybody, and one of us is diabetic, so it's even worse for her. We've been using Bob's Red Mill Whole Wheat Pastry Flour, which is nice, but nothing can really beat the lovely lightness of white flour--even when you combine it 1/2 and 1/2 with whole wheat flour, it makes such a difference. We haven't given it up altogether, but it's become more of a "treat" food. of flours. One knows dough is ready by how it feels not by exactly measuring ingredients. Just add flour slowly. I'm always tossing wheat germ and flax seeds into muffins and no-knead breads. Don't be afraid to experiment even when the recipe doesn't include different grains. There's lots of ways to get around overly processed flours and sugars (I use a lot of honey). I have noticed in the bulk flour section that there is a flour that says it's 'white' whole wheat. I think this means that it's a whole variety of wheat that's white. I have also noticed a red heirloom spring wheat floor that says it's whole grain both these flours are less course then regular whole wheat. We have started buying when I can find them whole grain farro products like pasta and even cookies. I haven't found a farro flour but it is a non hybridized very old variety of wheat. I like farro pasta as it doesn't get gooey when cooked like most whole wheat pasta's do, plus it has a nutty nice flavor. I just found this about farro, google is handy..I just learned somethings about ferro. "Farro is an Italian word that encompasses three varieties of heirloom grains: einkorn, spelt and emmer wheat. These are referred to respectively as farro piccolo, farro grande and farro medio. So rather than being a single grain, farro is a collection of three grains and the term farro can refer to any of these three grains." "What is high extraction flour, and how is it made? High extraction flour is a traditionally milled flour that has been sifted to remove some, but not all, of the grain’s original bran and germ. I favor this kind of flour for baking, for long-term storage and to use with the whole grain flours I mill myself. Traditionally milled high extraction flour is prepared first by soaking the grains (upwards of 24 hours) drying them, then grinding them to form a whole grain flour." The resulting flour is then typically sifted to remove most, but not all, of the bran and germ and is a traditional practice in Europe, the Middle East and Asia. Removing a portion of the bran and germ increases the stability of the flour, decreasing the odds that the fragile fatty acids found in the bran and germ will go rancid. " "Einkorn Flour and High-extraction Flour. I favor einkorn, a nonhybridized heirloom wheat, for my baking as it’s richer in phytonutrients, minerals and protein than many hybridized grains and it is well-tolerated by those who may be otherwise sensitive to modern wheat. I recommend Jovial Foods high-extraction flour for general baking for general baking, as well as sourdoughs and breads. " Jovial Foods have great cookies and tasty sourdough crackers. Think I'll try their whole grain Einkorn pasta. I buy imported Italian farro pasta at a local store called Pasta Works but it's really expensive. 3.50 a box seems a lot better then the 6.00$ they have started charging for imported ferro pasta. I try to buy locally but hey if our shops and stores don't offer whole grain products I'm going online and buying them from their sources. I am learning so much. No wonder I am not a great cook, just decent. I never try anything different. Maybe y'all might just inspire me. A good recipe may not be enough. Somethings require a knack, a karmic connection. Pie crusts and stroodle, pizza, bread and pasta dough absolutely do. is that it seems that a lot of really good bakers can tell if the dough is right by touch. A lot of cooking is an art but baking is a science. IMHO. is science. You need to follow the recipe exactly, or if you change it it has to be in stirct proportions. Working with yeast can be more of an art as temperature and humidty are players in how the dough comes together. The beauty of this recipe though is that the long "rest time" of 15-18 hours from start to finish does a lot to overcome the differences in your house temp and humidity and the heavy dutch oven overcomes differences in ovens. It's very chemical and precise and doesn't seem to have any room for improvisation or messing with the measurements. I am a great cook but can't even make decent corn bread. Pie crust forgetaboutit. isn't my strong suit either. I've become fond of the Pillsbury packages where the crust is already rolled into a circle and then it's rolled over itself and put in a cellophane and boxed. You get two in a box. They can be frozen for a few months too. frequently comes through repitition - at least in IMHO. And it helps if you have someone around who "has that connection" and can explain how to adjust something. all these wonderful recipes to Mr M, LOL! Seriously, although my Mother was an excellent cook, I somehow missed the boat. But I thoroughly enjoyed reading the recipes, and will certainly look forward to Wednesdays. I'll have to make sure that I eat before I join you guys next week--the bread looked absolutely scrumptious!